Twin Valley South’s Madison Wright competes in the 800-meter run during the Division III state track meet in Columbus on Saturday, June 6. Wright finished 13th in the event with a time of 2:25.48. 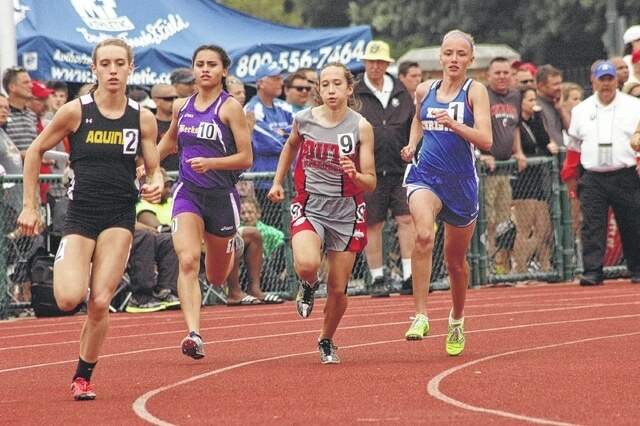 COLUMBUS — Madison Wright, a sophomore at Twin Valley South, competed in the Division III 800-meter run at the state track meet in Columbus on Saturday, June 6. Wright ran a time of 2:25.48, placing her in 13th. She just missed out on reaching the podium by 5.53 seconds. The winning time in the race was 2:16.07, set by Kalee Soehnlen from St. Thomas Aquinas. The race included seven juniors, five of whom made the podium, and three seniors. Wright made it to state by placing second in the district meet with a time of 2:27.55 before clocking a personal best of 2:17.96 in the regionals. This was her first year at the state meet but Wright is determined not to make it her last. “Next year I am definitely going to do better than this year,” she said. Wright has several races in her arsenal for the next two years. At regionals, she also competed in the 4×100 relay (with Abby Beneke, Grace Stewart and Myland Crews), 4×400 meter relay (with Stewart, Abby Creech and Lindsay Creech), and South’s record breaking 4×800 relay team of Wright, Megan Wright, L. Creech and A. Creech. The four broke the school’s record with a time of 9:45.40. Individually, Wright also competed in the 400-meter dash at the district meet.